Purpose is the destination we choose from a sea of possibilities. 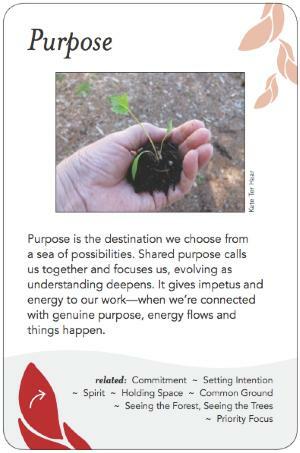 Shared purpose calls us together and focuses us, evolving as understanding deepens. It gives impetus and energy to our work--when we're connected with genuine purpose, energy flows and things happen. Purpose happens at the beginning, and changes occasionally over time. If you don't know your purpose it causes problems down the line. It may be captured by a question, such as "Why will you still be in existence 100 years from now? ", and comes up in persona coaching as well as groups, around questions such as "Why do you care about that?" or "What are your values?" Purpose scales. There may be a purpose of an organization, or of a series of sessions, or a particular meeting, or even a portion of that meeting. Purpose needs to be periodically checked in about, reevaluated -- perhaps through visioning exercises. Purpose guides goals, tasks, even products. It should guide resource allocation (time, money, attention) though often it does not. Purpose is the road you're on, and its destination. Purpose provides focus. People come from all different places, where does their purpose intersect and become shared? Purpose guides us in making decisions about allocation of time, energy, and money. Visioning sessions and retreats can help set and provide appreciation of a group's purpose. Purpose is established at the beginning, then again occasionally over time. If a group loses focus, the facilitator needs to remind them of their purpose and possibly reconsider if this is still the purpose. Allow for change and evolution over time, from both external conditions and internal changes in members or due to turnover. Upstream from all the other patterns, Purpose comes first, followed by Setting Intention. If purpose is a road, don't branch too much. Don't hold so tight that you don't allow for serendipity and happy accidents, but don't hold too loose either. If you take too much time to agree on a shared purpose, perhaps you're in the wrong group; purpose should be fairly self-evident. Beware of lack of purpose if there's dissonance or incongruence between supposed purpose vs. activities, or if people are feeling lost, asking why are we here, looping, wandering. If external conditions change vastly purpose may need to be revisited. Peter Block's book Community has the story of a community actvist group whose original purpose was to deal with inner-city crime and other "problems", but, with understanding of the issues, morphed into a purpose of enabling job creation, renewal, learning, and deepening of relationships and self-sufficiency of the community. The new purpose totally changed the tenor, energy and activities of the group. Example of dealing with burnout: Revisit where were you when this project started? Write timeline, how have things developed. How feeling now? Congruent or incongruent. If incongruent, where go next? Karen Hixson to maybe write up more. . . . Values Card Sort for individuals, could definitely be adapted for group use.